Photographed along SR-95 east of Parker, La Paz County, Maricopa Co., Arizona, USA on Mar. 14, 2010. FLOWERS: Bright pink flowers arranged in a hemispherical cluster. Blooming in mid spring in years when adequate winter rains have soaked the desert. 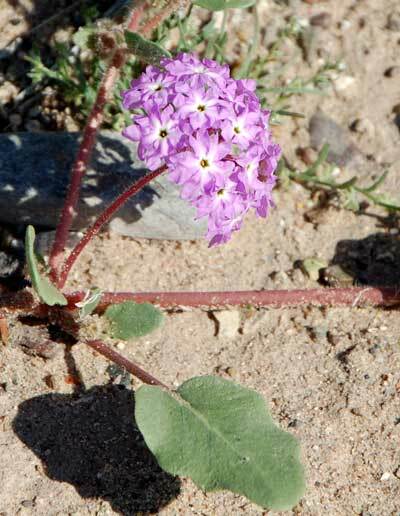 Notice that this plant is not in the verbena family which it superficially resembes. RANGE: Rare in the Sonoran Desert - more likely to be found on the western fringes where the Sonoran meets the Mojave Desert. Prefers soils with high sand content. ANNUAL: Reddish stems of this spring annual spread out across the sand eventually producing small to large clumps of flowers blanketing the sand. Stems reddish. LEAVES: Dark green leaves are opposite on the stems, often densly hairy and/or glandular. The margins are smooth and the outline is more-or-less heart-shaped. FRUIT: A capsule with wing-like flanges and top beak formed from the old flower.